Dar es Salaam — The ban on cashew nuts exports has resulted in a gap in Tanzania's balance of payments, widening the deficit by about $500 million in the month of November last year. The monthly economic review of the central Bank of Tanzania (BoT) for December 2018 has it that the country's overall balance of payments (BoPs) recorded a deficit of $753.0 million in the year that ended on November 30, 2018, as against the deficit of $171.6 million recorded in October that year. The review says that export earnings for cashew nuts-- currently Tanzania's most valuable export crop--dropped due to a decline in export volumes that is attributable to the government decision to halt raw cashew exports and opt for domestic processing of the crop. Cashew exports fetched $575 million, which was equivalent to the combined exports earnings from five commercial crops, namely tobacco, tea, coffee, cotton and sisal. 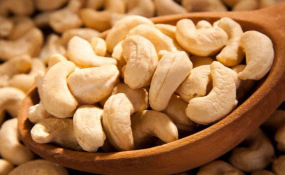 In a related development, the government recently announced that it had bought more than 200,000 tonnes of cashew nuts from farmers in the cashew farming regions, ready to be exported after they are processed locally. The BoT review also shows that Tanzania's balance of payments had a surplus of $1,749.8 million during the year that ended on November 30, 2017. Growth of the balance of payments deficit is partly explained by widening of the current account deficit. In that regard, the current account balance weakened to a deficit of $2.5 billion, up from a deficit of $1.4 billion in the year to November 30, 2017. This was mainly due to a decline in exports, compounded by an increase in imports, mostly capital goods. The value of exports of goods and services declined to $8.5 billion in the year which ended on November 30, 2018, slightly down from $8.7 billion in the year to November 30, 2017. This was largely on account of a decline in exports of goods. Earnings from exports of goods decreased in the year to November 30, 2018 compared with the similar period in 2017. The decline was largely driven by non-traditional goods exports, which accounted for 38.0 per cent of the export of goods and services, and 71.4 per cent of goods exports. Export earnings of non-traditional goods declined by 9.7 per cent, to $3.2 billion; with all the major categories recording declines, except horticultural products. Earnings from gold exports - which is a major non-traditional good - dropped on account of a decline in export volumes. Export earnings of manufactured goods decreased by 4.4 per cent, to $816.1 million, in the year to November 30, 2018, largely following a decline in earnings from exports of textiles, cotton yarn, footwear, fertilizer, edible oil and cement, as well as sisal and tobacco products. The export earnings of traditional goods declined by 1.0 per cent, dropping to $885.5 million, in the year to the end of November 2018, following a fall in export earnings of tea, cashew nuts and cloves. The decrease in the value of tea exports was on account of a decline in both export volumes and prices. Cotton registered a significant increase in export earnings owing to a surge in export volume s following a good harvest in the 2017/18 farming season, as well as higher prices in the world market. Foreign exchange receipts from the export of services rose to $3,994.5 million in the year to November 30, 2018, up from $3.8 billion in the similar period in 2017. The slight increase was driven by travel and transport receipts. Earnings from Travel--dominated by Tourism--increased owing to a rise in the number of tourist arrivals. Also, Transport receipts increased due to a growth in the volume of transit goods to-and-from neighbouring countries, particularly Zambia, DRC, Rwanda and Burundi. This came following improvement of operations at the Dar es Salaam port, coupled with the removal of value added tax (VAT) on auxiliary services of transit cargo, as well as reduced road transport control barriers by the relevant authorities. The country's Goods and Services imports bill amounted to $10.3 billion in the year to November 30, 2018, representing an 8.2 per cent increase over the previous year's bill. This was largely driven by Goods imports. In fact, all major categories of goods imports recorded growth in the year to November 30, 2018 compared with the corresponding period in 2017. The increase in imports bill for capital goods was associated with the ongoing infrastructural development projects across the country - including the construction of a standard gauge railway (SGR); airports and ports, roads and bridges.